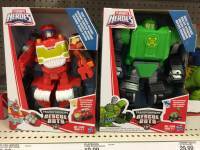 The Transformers Rescue Bots line rolls on as it builds up to its transition into Rescue Bots Academy, with the release of a new Megabot figure. Quick Dig Boulder – a version of Boulder as an excavator – has been found in a Target in Fort Wayne, Indiana. The assortment also includes the “Night Rescue” Heatwave, who has been repacked from a previous assortment. I ended up selling my Rescue Bots Series 2/smaller scale bots. I sold all the 2nd series human figs too. Everything was still carded. The entire series, Heroes & Villians. The following month, they stopped selling human/bot 2 pack, period. The stupid thing was i hadn't sold anything in since 2003. Before MP-1 Masterpiece Convoy was released in Japan. A drop dead gorgeous mom who loved her son, & her son loved RB made me blind to my own collection. Later I was hoping the Walmart 4 pack of all the original 4 RB's, would go on sale least $20 – $25. Nope, they still $34.87 at walmart lol. Heatwave is an older toy repacked, FYI – Boulder is new, though. Which state are you in? In Indiana. Found these in Fort Wayne. View attachment 27960858 I found these at Target. Entertainment Earth lists them as Megabots Wave 3. There's no shortage of Transformers to buy, but I've found myself getting into Rescue Bots. Odds are when the new series starts, I'll be all in.